The Men and Boys Memorial was dedicated on September 10, 2011. The following day, which marked the 154th anniversary of the 1857 Mountain Meadows Massacre, the entire Mountain Meadows Site was dedicated as a National Historic Landmark. On September 11, 1857, the Arkansas Emigrants were persuaded to leave their beseiged camp, by Mormon militiamen, who were bearing a white flag of truce. Falsely promised protection by the militiamen, the Arkansas Emigrants were instructed to lay down their arms. Under the direction of the Mormon militiamen, the women and children, and the wounded, departed from the emigrant camp first. The men, and older boys, followed, and were each escorted by an armed member of the militia. When the men and boys neared the site where this memorial now stands, a signal was given. The militiamen turned and fired upon the unarmed Arkansas Emigrant males, and within only a few minutes, all of them were dead. Further ahead, all of the women, wounded, and every child over the age of 6, were murdered at the same time. 17 children, all under the age of 6, survived. Members of the Mormon militia hastily buried the victims on the next day, in shallow graves located near to the area where the they had fallen. Not too long afterwards, wild animals disinterred the bodies, and over the next two years, local farmers and soldiers from the U.S. Army reburied the bones. The area where the Memorial stands has traditionally been associated with the men and boys who were killed. This area laid untilled, and was protected from desecration, by the private land owners, out of respect for the victims who are buried in the area. Small rock cairns marked the burial places of some of the victims, but with the passage of time, most of the stones were scattered. One of these stones, with a cross etched onto its face, was incorporated into the Men and Boys Memorial. The Men and Boys Memorial is located approximately one mile from the siege site (1999 Monument). 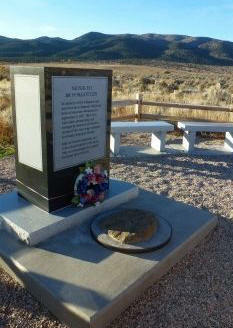 The Men and Boys Memorial Site is located on Utah Route 18 at milepost 31, on the left. The monument is clearly signed and is approximately 1/2 mile further North of the turnoff for the other Mountain Meadows Monuments. 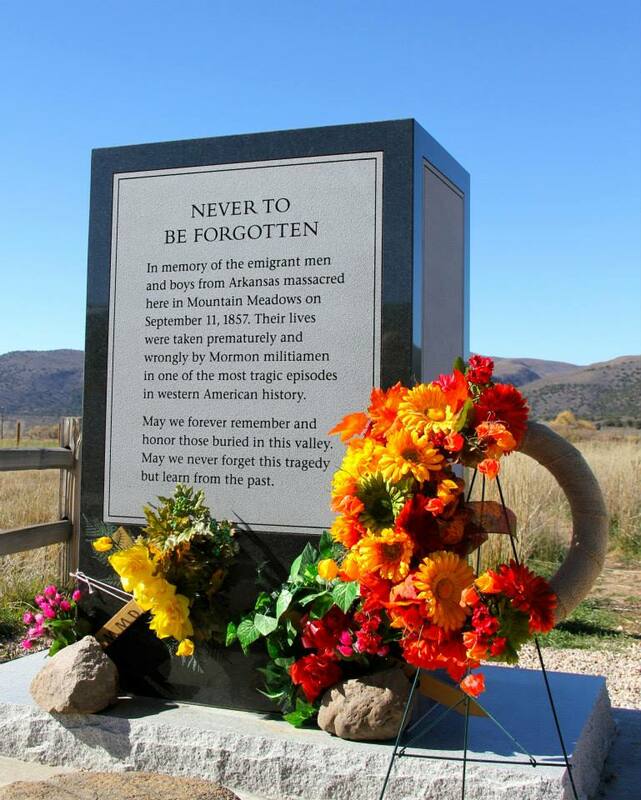 In memory of the emigrant men and boys from Arkansas massacred here in Mountain Meadows on September 11, 1857. Their lives were taken prematurely and wrongly by Mormon militiamen in one of the most tragic episodes in western American history. May we forever remember and honor those buried in this valley. May we never forget this tragedy but learn from the past.